Influenza viruses are one of the greatest threats to global public health and security, as any new virus might cause the next pandemic. Early detection and investigation in humans are therefore critical. Even in a country in turmoil, where resources may be very limited, it is important to maintain the ability to identify early events – such as a cluster of infections that need prompt investigation – as well as appropriate infection control and rapid laboratory diagnostics. In the absence of routine surveillance during the ongoing conflict, Syrian public health and medical personnel are focusing on early warning and response efforts. 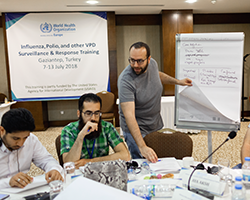 To support this, 40 Syrian public health responders participated in training on the detection of and response to new influenza viruses in support of the early warning alert and response network (EWARN). They focused on the threat of a new influenza virus, which could signal the next pandemic if the virus were to change to become easily spread from person to person. WHO/Europe provided the 1.5 days of training in collaboration with the WHO field office in Gaziantep. The WHO Regional Office for the Eastern Mediterranean co-facilitated the event. Through a combination of lectures and small-group exercises, participants learned about current threats and outbreak detection, response and control. “The training enhanced local and regional preparedness, surveillance and rapid response capacities,” said Dr Asm Amjad Hossain, who coordinates WHO support, guidance and training for EWARN members from WHO’s field office in Gaziantep. The training was held in Gaziantep, Turkey, on 7 and 8 July 2018, using material developed for a global 4-day workshop held in November 2017 in Bangkok, Thailand. The original material was modified to meet the needs of the Syrian participants. The training was funded by the United States Agency for International Development (USAID). WHO’s work to support disease surveillance and outbreak response in northern Syria is made possible with support from the United Kingdom’s Department for International Development (DFID), the European Commission’s Humanitarian Aid and Civil Protection department (ECHO) and USAID.